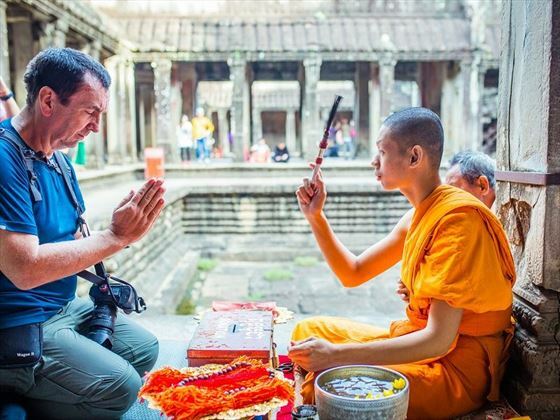 Begin this nine-night small escorted tour through Cambodia in Phnom Penh - picture ornate temples and riverside towns, rice fields and scenic boat trips, beaches, caves and royal palaces. You’ll experience all this and more on one of Southeast Asia’s most beloved countries. 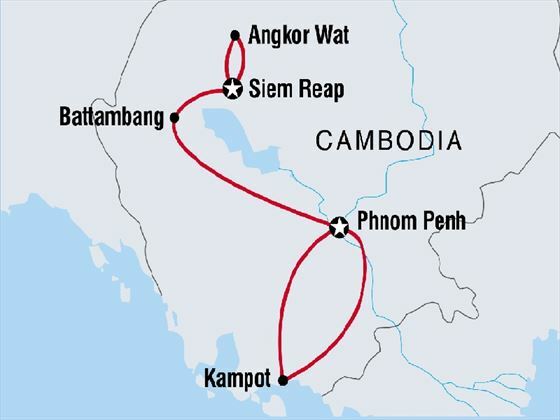 The trip begins in the capital Phnom Penh and takes in the beaches of Kep, Battambang countryside and river-town Kampot, ending with a trip to the world-famous Angkor Archeological Park near Siem Reap. 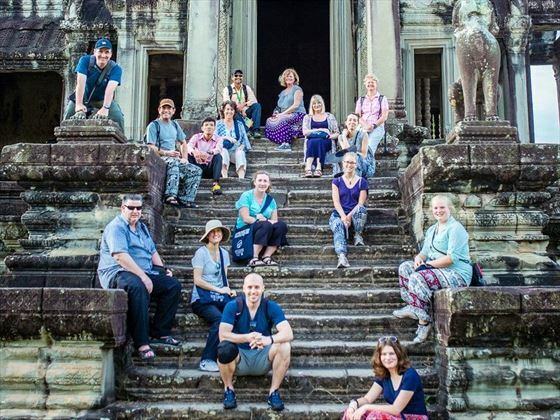 Highlights include learning about Cambodia’s moving history at the Tuol Sleng Prison and Killing Fields, enjoying a boat trip down the Sangker River and of course, touring mighty Angkor Wat, the world’s largest religious monument. You’ll also visit caves and beaches, local wineries and traditional rural villages along the way. This Cambodia tour is ideal for those who love a blend of adventure, history, nature and culture (INT - TKKI). 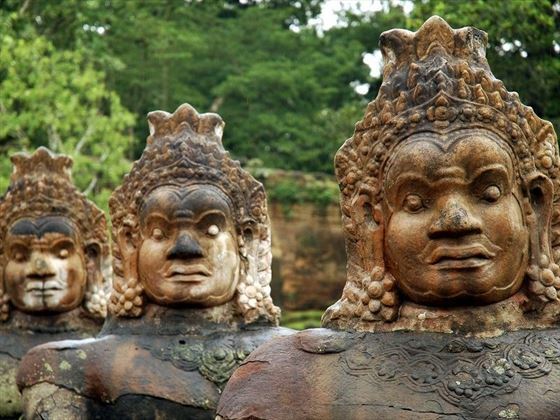 Explore the Angkor Archeological Park and mighty Angkor Wat. Take a classic boat trip to Siem Reap along the Sangker river and Tonle Sap. Visit the moving Tuol Sleng Prison and Killing Fields near Phnom Penh. Enjoy the riverside town Kampot and surrounding caves, countryside and beaches. Experience a true slice of Cambodia in Battambang where you’ll visit local industries. Spend time in the bustling capital Phnom Penh and discover lively Siem Reap. Your Cambodian adventure begins with an airport transfer to your hotel. If you arrive early, head out to explore the city. Browse at the central market, stroll along the riverfront to Sisowath Quay or visit the National Museum. There will be a welcome meeting at 6pm followed by a group dinner at Friends, a popular NGO-run restaurant which supports vulnerable youths from the area, teaching them cooking and hospitality skills. Enjoy a fusion of Asian and Western tapas dishes. Today you’ll depart Phnom Penh and travel to the charming riverside town of Kampot, which is filled with colourful French colonial architecture and bordered by the stunning Bokor mountains. The afternoon is yours to explore, wander by the river or relax in one of the many restaurants with gorgeous views. Optional activities include a visit to the hilltop temple of Phnom Chisor or the Tamao Wildlife Sanctuary, which rescues animals like gibbons and sun bears. You can also enjoy a traditional massage with Seeing Hands, which employs local blind masseurs. Take a day tour through the beautiful Cambodian countryside. Highlights include a stop at the Kampot Pepper Project to learn about why Cambodian pepper is known as the world’s best and a walk through rice fields to Phnom Chhnork limestone cave, which has a 7th century brick temple inside. 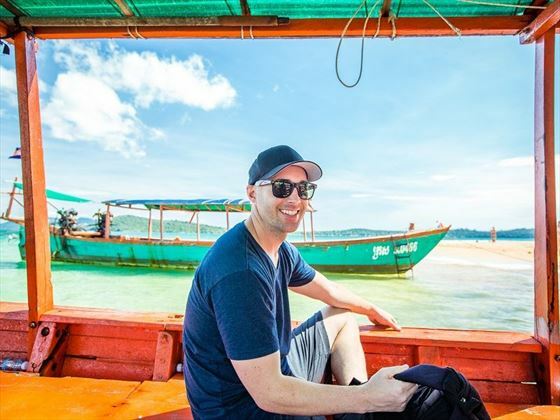 You’ll end the tour at Kep beach, which was one of the most prestigious beach towns in Cambodia until the 1960s. You can still see the shells of many grand mansions and villas which were sadly destroyed by the Khmer Rouge. Make the four-hour journey back to Phnom Penh, where you’ll learn about Pol Pot’s murderous Khmer Rouge regime, which was responsible for the deaths of an estimated three million Cambodians, just over forty years ago. At Tuol Sleng Prison Museum, also known as S21, you’ll see photographs of some of the 20,000 people who were held there and the cells they were kept in. The final stop for many of these victims was the Choeung Ek Killing Fields, which you’ll also visit. Pay your respects at the peaceful countryside memorial, which features a moving stupa made from the skulls of around 8,000 victims. Although learning about the genocide is a confronting experience, these activities are important parts of the Cambodian experience. However, if you’d prefer to skip these visits, please let your tour leader know. 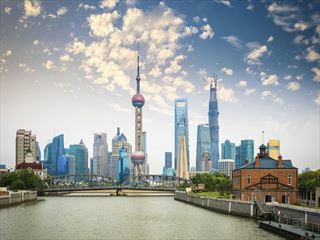 Alternative activities include taking a cyclo tour of the city, visiting the Royal Palace and Silver Pagoda or taking a trip to the National Museum. Today you’ll make the five-hour journey from the capital to Battambang, where you’ll experience a slice of true, rural Cambodian life. Along the way, you’ll visit some local pottery and silversmith businesses before arriving in Battambang. Take the rest of the afternoon to relax, explore the riverfront, wander the streets filled with French colonial architecture and have a leisurely evening meal. Take a Cambodian tuk-tuk, known as a remork, on a tour through the unspoilt surrounding countryside. Highlights include a stop at the wooden stilt-house village of Wat Kor. These historic houses date back to the early 1900s and represent pre-French-colonial Cambodian culture. You’ll get to meet the locals and visit some cottage industries which produce goods like dried banana, rice paper, aromatic fish paste and sticky rice. There’s also a chance to visit Cambodia’s first winery, Prasat Phnom Banan, where you can sample some of their wine. You’ll also get to see Wat Bai Dom Ram temple which is known for the large fruit bats that live in the surrounding trees. As an optional activity, you can also visit the Battambang Artistic Social Centre. After checking out of your hotel, you’ll board a private boat to the lively city of Siem Reap. The trip lasts around six hours and follows the Sangker River to the largest lake in Southeast Asia, Tonle Sap. Enjoy the peaceful surroundings and scenery, including fishermen and traditional villages with stilt houses over the river. Note that in April and August when the water levels are lowest, you’ll travel by minibus rather than boat and take a trip on Tonle Sap Lake instead. Spend the rest of the day relaxing in Siem Reap, which is the jumping-off point for Angkor Wat. Have a massage and a meal, wander through the local market or taste some of the local street food. You’ll spend the whole day visiting the UNESCO-listed Angkor Archelogical Site, which lies just outside of Siem Reap. A guide will take you to temples such as Angkor Thom and Bayon, which is famed for its 200 incredible carved stone faces and 50 Gothic towers. The highlight is mighty Angkor Wat, a 12th century temple with elaborate sculptures, carvings and impressive architecture that covers 400 square kilometres. Have lunch at the Sala Bai Hotel School, which trains local youths so that they can get a job in the hospitality industry. After you’ve eaten, visit Ta Prohm, an atmospheric temple set in the forest. Here the stone walls and statues are interwoven with tree roots and embedded into the jungle. It’s not hard to see why the temple was famously used as a setting in the movie Tomb Raider. End the day by watching the sunset over the temples. If you feel up to an early start, you can watch the sunrise over Angkor Wat before continuing your temple hopping. Highlights today include Banteay Srei and its intricate carvings and another jungle temple, Preah Khan which has a network of corridors which are slowly being reclaimed by nature. If you have extra time, you can opt to visit the fascinating Landmine Museum. After dinner, you’ll get to watch a captivating performance of the Phare Cambodian Circus, which is a bit like the Cambodian version of the Cirque Du Soleil. Enjoy a diverse performance from locals which includes music, dance and acrobatics, theatre, aerial acts, fire dancing and contortion. You’re free to depart whenever you like. If you have some spare time, you can make use of your three-day temple pass to explore more of Angkor Archaeological Park or hire a remork driver to show you more of the surrounding sites. Do some shopping in Siem Reap, enjoy a final massage and meal, relax by the hotel pool or take a Khmer cooking class. Accommodation: nine nights in a hotel. Internal transport private mini-bus, boat, remork (tuk tuk). 9 breakfasts, one lunch and one dinner. Activities: countryside tour and Phnom Chhnork in Kampot and the Tuol Sleng Prison Museum and Choeung Ek Killing Fields near Phnom Penh. Banan winery tour and tasting and guided Battambang countryside tour. 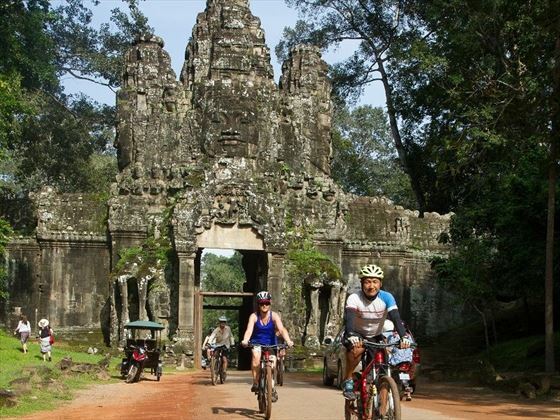 Siem Reap three day Angkor Pass, Angkor Temples guided tour and Phare Cambodia Circus ticket. Amazing savings Book your holiday by 3 May 19 and receive up to $310 discount. Travel before 15 Dec 19. This wonderful six-night small group escorted tour encapsulates Cambodia's classic charm, culture, and vibrant lifestyle. Starting in Phnom Penh and ending at Angkor Archeological Park, this is a whirlwind insight into this diverse country.